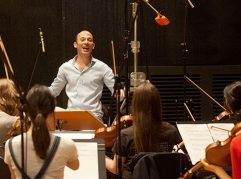 Fanfare group at the recent recording day at Trackdown Studios. 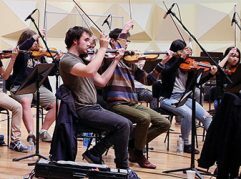 Earlier this month the eight Fanfarers came together at Trackdown Studios to record their compositions live with the Australian Youth Orchestra conducted by Toby Thatcher. You can hear a little snip of Oliver Beard’s fanfare on our FB Page. Video interviews and the final recordings will be available soon and we can’t wait to hear them. In the meantime see the photo’s from the day @Fanfare Gallery. As part of our process to extend the reach of the Fanfares we have partnered with the Art Gallery of NSW for more audiences to hear these amazing compositions by young artists. This Sunday 25 September as part of the gallery’s Resonate Series, Cordelia To’s fanfare Multiculturalistic Australia will ring out to audiences at the Grand Courts. You can book for the 8pm concert by the Australian Haydn Ensemble and Celeste Lazarenko. ...Find out more. Cordelia is busy with her uni studies at ANU and is currently working on a symphony for an international competition, the final will take place in Asia. She has recently won a silver medal for piano at the Australian National Eisteddfod. Chrysoulla Markoulli one of this year’s participants has been busy with the ATYP sound design mentorship for Fight with all your might the zombies of tonight. Chrysoulla says, “It has been lovely meeting the team at ATYP over the last few weeks. 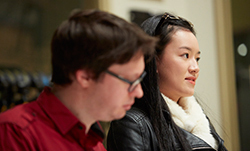 I recently attended the first script read through. It was great hearing the young talented cast take on the role of their characters. I am sure they will do a great job when it comes to the final performances! Stephen Francis has been really great in giving me an understanding of how music works in the theatre. Over the coming weeks I look forward to learning as much as I can, in the process of working with him on the sound design.” The production will run 9-19 November and you can book your tickets earlier HERE. 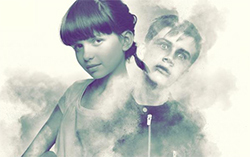 ATYP are also holding a Celebrity play reading fundraiser of the play and are joined by some of Australia’s award winning actors on 17 October. We love seeing and hearing from our past participates and their new projects. 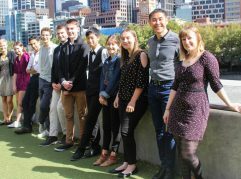 Sam Weller, one our 2015 Fanfarers will be launching Ensemble Apex with a free concert, 7pm, Wednesday 5 October at the Sydney Conservatorium of Music. Ensemble Alex will perform solo and chamber repertoire including Leonard Bernstein’s Prelude Fugue and Riffs. The group aims to provide a setting in which young musicians can demonstrate their virtuosity playing in both ensemble and concerto settings. Great work Sam! When you listen to music, multiple areas of your brain become engaged and active. But when you actually play an instrument, that activity becomes more like a full-body brain workout. What’s going on? Anita Collins explains the fireworks that go off in musicians’ brains when they play, and examines some of the long-term positive effects of this mental workout. See the video. 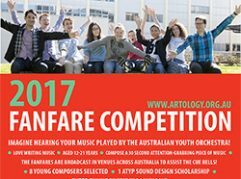 Artology’s Fanfare Competition is the winner of the 2016 Art Music Award for Excellence in Music Education. Thanks from all the team at Artology.